State Attorney General Dana Nessel says it's time for Engler to sit down with investigators to answer questions regarding the Larry Nassar investigation. LANSING, Mich. — Just moments after the Michigan State University Board of Trustees voted to accept Interim President John Engler's resignation immediately, State Attorney General Dana Nessel says it's time for Engler to sit down with investigators to answer questions regarding the Larry Nassar investigation. "The president who served for a year is aware of information, we want to make sure we reach out and find everything we possibly can," said Kelly Rossman-McKinney, Spokeswoman for the Attorney General's Office. 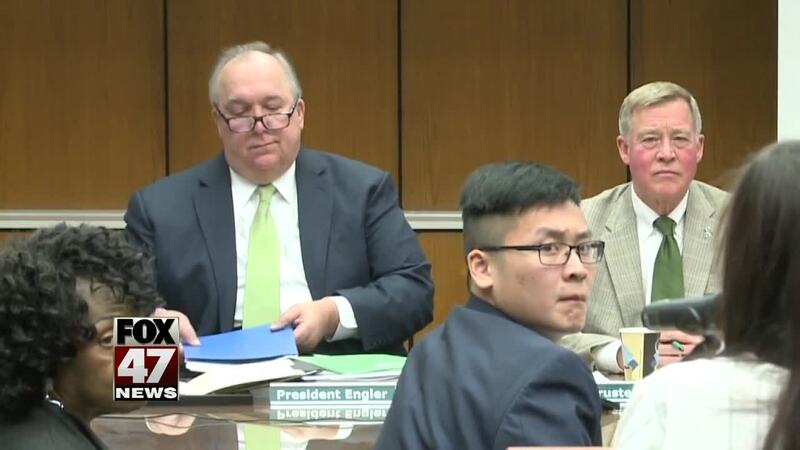 Though Engler's time as president at Michigan State is done, his involvement in the investigation isn't. Engler is just the latest name tied to the investigation detailing Larry Nassar's sexual abuse. Rossman-McKinney says Nessel's team is hopeful Engler will cooperate, as his compliance will be helpful to the investigation. "It would be unfortunate if he chose not to cooperate with our request," she said. "Ultimately his downfall was his complete and total lack of sensitivity to the victims, and that's something that's a top priority for all of us, to make sure that those young women get justice." When the investigation opened in October of 2016, the university was reluctant to share information. Now, Rossman-McKinney says that things are looking up for Michigan State. "There was a concerted effort on the university's part to withhold information and fight us at every step, and it appears to be a much more cooperative board committed to moving forward, and we look forward to working with them as well, so it may be a new day at MSU." Rossman-McKinney says that state attorneys are leaving no stone unturned. The Attorney General's office hopes to restore the culture at Michigan State as soon as possible.